Anchors away and set sail for swashbuckling pirate adventure on the high seas in this piratical musical that's sure to shake your booty! Young twins Jack & Liza Periwinkle yearn for adventure, so imagine their joy at discovering a real life treasure map! 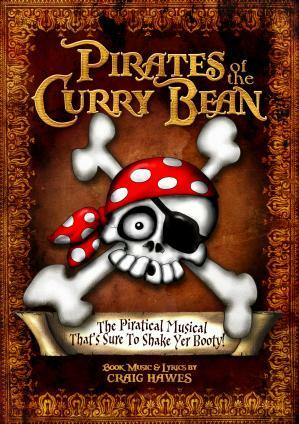 But when the infamous Redbeard and his pungent Pirates of the Curry Bean steal the map and kidnap their mother, the race is on to rescue her, reclaim the map and find the treasure! Accompanied by their faithful cat Fiddlesticks, the twins join a mad admiral and his crazy crew on a voyage of adventure that takes them from Old London Docks to the mysterious island of Lumbago in the sea of Sciatica! Will they be first to find the treasure chest, or is a surprise awaiting them that's even better than gold? With colourful characters, sparkling songs and a witty script as sharp as a cutlass, this show is dripping with piratical style!